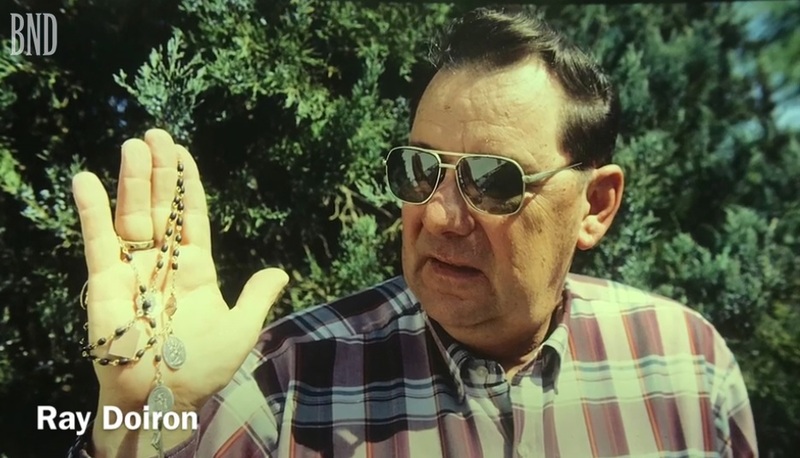 Pictured above is Ray Doiron with rosaries that turned gold. August 27, 2018 - Read full article [here] with video. In 1994, thousands came to pray at the National Shrine of Our Lady of the Snows in Belleville. Ray Doiron, a truck driver from Renault, said he saw the Virgin Mary on the 13th of every month. In 1994, rosaries turned to gold when believers say Virgin Mary appeared in Belleville. This is another installment of “Into the Archives,” a series that looks back on stories from the Belleville News-Democrat archives. On the 13th of every month, a small group gathers at the National Shrine of Our Lady of the Snows in Belleville to pray. They are the remnants of a group who prayed with Ray Doiron, the Southern Illinois man who said he saw an apparition of the Blessed Mother and heard her voice. In 1994, the National Shrine of Our Lady of the Snows experienced an influx of thousands of pilgrims and believers from all over the country. They came to practice devotion to the Virgin Mary with Doiron. News reports said the Virgin Mary stopped appearing to Doiron in October 1994. However, a published collection of the messages Doiron said he received are dated as early as Feb. 11, 1993, and as late as Dec. 10, 2003. Doiron, a retired Bunny Bread truck driver from Renault, said he saw and received messages from the Virgin Mary at various times and places throughout his life, including while lying on his couch at home and at the Shrine in Belleville. The messages, which Doiron shared, encouraged the faithful to pray and “return to Christian basics,” according to news stories printed by the Belleville News-Democrat at the time. Originally, Doiron prayed in the Lourdes Grotto area of the shrine with a few hundred others. But after the visions were shared with the community through news stories, a few thousand believers came, and shrine officials moved the group to the amphitheater. People said they came to pray for healing for themselves or their families. The crowd was so large, an ambulance remained parked outside in case of emergencies. Some of the faithful said their rosaries turned gold, displayed pictures in which light in the shape of a figure seemed to be descending from the sky, and smelled the scent of roses during prayers. Doiron died on Oct. 27, 2015. The lid on his vault had a picture of Doiron with his first wife, June, who died in 1995; his second wife, Claradel; and the Virgin Mary. Doctors told Doiron he would never walk again. “He came out of that and walked with a cane until he went to Medjugorje back in 2000 or 2001,” Donjon said.She said Doiron was told by the Virgin Mary to go to Medjugorje, a town in Bosnia and Herzegovina, where six children reported seeing Mary in June 1981. It has since become a popular location for Catholic pilgrimages, though it has not been officially recognized by the Catholic Church. Jan Epplin of Pinckneyville came to pray with Doiron at the Lourdes Grotto and later with the crowds at the shrine amphitheater. In a recent interview, Epplin said she personally smelled the scent of roses and saw small, intense blinking lights of different colors during devotions with Doiron. Epplin said, “The moment our Blessed Mother would come, Ray’s eyes would go straight up.” When the visitation ended, Epplin said, his head would drop. She shared nearly a dozen Polaroid photos of the skies above the devotions to the Virgin Mary at the shrine. “He (Doiron) would call her ‘my little lady,’” Epplin recalled. She remembered Doiron describing his visions as “so beautiful.” “Ray would say, ‘I just wish all of you could see her as I do,’” Epplin said. Though Doiron has died, he answered many of the questions that people may have had about his visions in his book, “Messages from our Heavenly Mother to Her Children.” What was it like when Doiron saw the Virgin Mary? Doiron wrote: “When Our Lady appears to me, She usually comes on the Visitation of the Rosary. There is a little wind, and when it stops, there is a bright light. With that, Our Lady’s image comes forth. I feel a warm and peaceful feeling all over. What did she look like? “She is the most beautiful Lady I have or ever will see. She is young and very regal. The light seems to glow from Her and in Her. Her whole body appears to be an eternal light, and this light appears to radiate from all around Her.” “Her face, gown and everything about Her is dazzling as if made of the purest, finest diamonds with elegance, and everything around Her sparkles. Her hair is very dark brown, and Her eyes are a very dark blue.” Was she always wearing the same thing? Doiron said she appeared differently “to show you that I am the same person in all the apparitions over the centuries.” He didn’t always see an apparition of the Blessed Mother — sometimes Doiron only heard her voice. What did she sound like? “Her voice is soft and sweet, but with discipline. I’d know this voice anywhere. She is very young, but talks to me as if I were Her child.” Why did she always appear on the 13th of the month? “Our Lady said that She wished that the 13th of each month would be celebrated as a Marian day of rosary and prayer,” Doiron wrote.